ORNATO by De Medici - classic scroll jacquard Italian bedding in their signature "azure" color - an exquisite 600 thread count yarn dyed jacquard. Please see Ornato for pricing in white, ecru and sable. Ornato Azure is sewn in the USA with fabric milled and finished in Italy. ORNATO AZURE is custom made to order with shipment in about 4 weeks. Combine ORNATO AZURE sheets with De Medici Coperta quilted coverlet and shams. 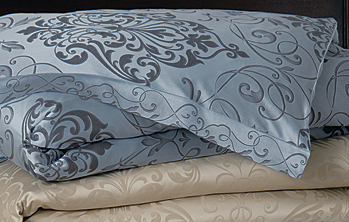 Or return to De Medici Fine Linens. Ornato Azure King Flat Sheet 115"x115"
Ornato Azure Queen Fitted Sheet 60"x80"x17"
Ornato Azure Queen Duvet Cover 88"x90"
Ornato Azure King Duvet Cover 102"x90"
Ornato Azure Boudoir Sham 12"x18"